Currently, everything is still in the early planning stages. Naturally, I am not a planner. More a pack-up-and-go kind of guy. So preparing for a trip like this one is not exactly like going on a Sunday afternoon pleasure ride to Alices Bar & Grill for a burger. Actually, this trip will require a lot of planning.....the right bike, the best riding gear, weather planning, visas, insurance, camping gear, route planning, gas and service stations along the route, tools, spare parts, communication devices, personal items, stuff I can do without and stuff that is a must have, etc etc. But hey, I asked for it. Here it is. I am ready! Having ridden a Kawasaki KLR 650 in the early days, my Harley Davidson (HD) Nightrod Special to Sturgis two years in a row, on a HD Ultra Glide to Los Angeles, ventured Kauai and Maui on a HD Road King, recently toured Thailand for 3 weeks with stops at the Pattaya and Phuket Bike weeks on a Kawasaki Versys, I felt it was time for something bigger. After getting my motorcycle license in Germany in the late 70's, I always knew, one day, I would take a trip on a motorcycle that would probably mark a milestone in my life . It wasn't until February 2014, when I chatted with a Spaniard named Pol outside Wat Pho in Bangkok. 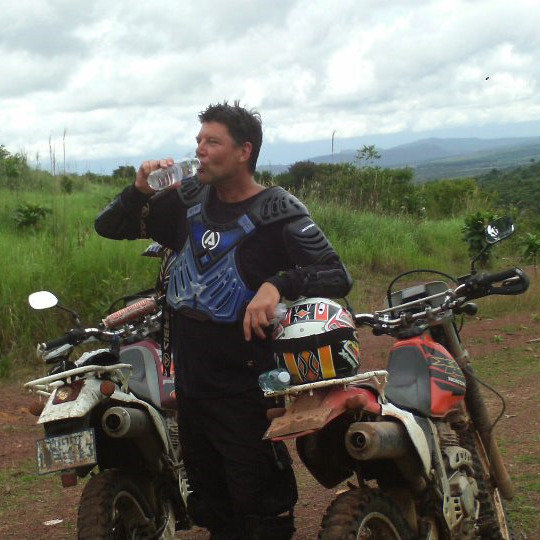 Pol was 3 months in to an "Around the World" journey on a Honda African Twin (www.caminoalaaventura.com). He was selling bracelets to finance the remainder of his trip. I also read about a US couple, Chris and Erin, who completed a "RoundtheWorld" adventure taking 4(!) years (www.ultimatejourney.com). "Incredible", I thought to myself. On May 15, 2014, I set my plan in full gear to ride from San Francisco, California to Ushuaia, Tierra Del Fuego, a town in Argentina, considered to be the "southernmost city in the world". Crazy....? Maybe...but then, maybe not.